Osaka has some nice beaches which can be reached in 1 hour. When the hot season comes around, many people search for places to enjoy the sand and surf. If you have the time and money, you would head to Okinawa, but what if you find yourself in Osaka? Of course metropolitan Osaka is not blessed with beaches, but here are a few of my recommendations to help people in the area enjoy the ocean air and cool off with a swim. Each beach can be reached in less than one hour from downtown Osaka. Tokimeki Beach is almost on the southernmost tip of Osaka, and it is an expansive beach with white sand and clean water. It is one of Osaka’s foremost beach resorts: it is popular for clam-digging during late March to early June, and bathing from July 1st to late August. The beach also has many beach volleyball courts (including official ones for serious players!) A shuttle bus services from Tannowa Station is available during the summer peak season. Nishikinohama beach has been designated as one of the 100 most scenic greenery spots in Osaka. It is a 1 km long sand beach with pine groves.This beach park is popular for its easy accessibility: it is a ten-minute walk from Nishikihama Station. Visitors can enjoy digging clams at the beach from early April to early June and bathing in the sea from July 1 to August 31. The park is full of people enjoying marine and beach activities. It is a nice place to watch the sun setting over Osaka Bay. This beach is located across the water from Kansai International Airport. It is a well known artificial beach with white sand and palm trees. Aside from the swimming area, there is an area designated for wind surfing which provides an excellent location for marine sports. 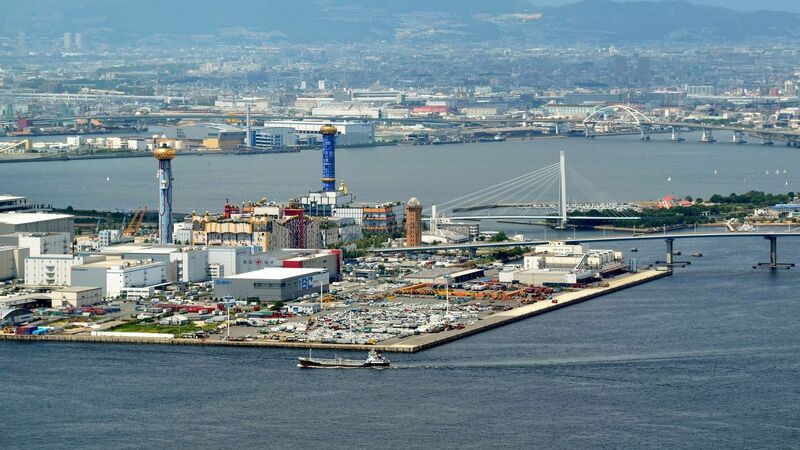 The view from the beach includes Rinku Town and the bridge leading to Kansai International Airport. The beach opens in early July. Access : 15 minute walk from Hakotsukuri Station on the Nankai main line. Hakotsukuri Beach is an artificial beach in the southern part of Osaka with nice scenery of the blue ocean and white sand. On clear days, Awaji Island, Kansai International Airport and the Akashi Kaikyo Bridge can be seen. The beach is open every year from July 1st to August 31st. Access : 3 minute walk from Rinku Town Station on the JR and Nankai airport line. Marble Beach is a 900-meter long white shingle beach created along the shoreline of Rinku Town. It is part of Rinku Park. The contrast created by the white stones, green pines and the blue ocean and sky is very pretty. It is an ideal spot to enjoy the sunset with Kansai International Airport in view. In summer, the car park is filled with couples enjoying the sunset!